This Vestil A-3636 dock plate bridges the gap between a truck and loading dock and is suitable for use with two wheel hand trucks. It is made of aluminum for light weight and resistance to corrosion and has a 500-lb. capacity. 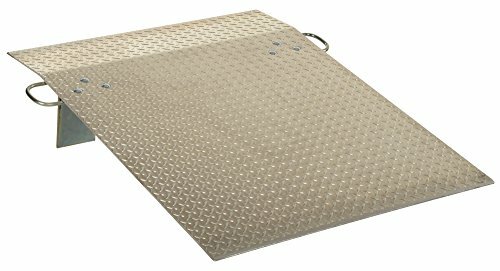 It is 1/4" in thickness for added strength and has a non-skid raised treadplate pattern for safety. It has bolt-on zinc-plated legs and lifting handles on each side for portability, and the legs lock for safety during loading and unloading. This hand truck dock plate is 36" in length, with a 36" usable width. It has a 5" height differential, and the bend is located 9" from the edge. View More In Loading Dock Plates. If you have any questions about this product by Vestil, contact us by completing and submitting the form below. If you are looking for a specif part number, please include it with your message.